Day 8 – Went to back to Tienanmen square and went inside. For those who don’t know, behind the red wall is the Forbidden City. The place is freakin massive and a lot of it looked the same. 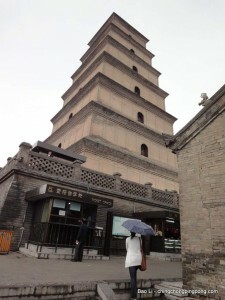 Day 7 – We took the super fast train from Beijing to Tianjin for some shopping. In 2008, this train set the world record for conventional trains at 350km/h. When I was riding it, the train topped out at 329km/h. If this is just a conventional train on wheels, I can only imagine what the new Maglev line can do when it’s completed. I think this was the first day where we didn’t go see any ancient sites, they were really all starting to look the same. Some palace, temple, etc… always built on top of a crazy number of stairs. Once again, the weather was hot and humid. Difficult to breath when the humidity is near 100% but at least it rained today. That kinda made things better. Anyways, day 3… it rained… a lot… but that wasn’t going to stop us. We went into that museum that we walked by in day 2. It was like a museum of anthropology, mostly old artifacts, human evolution in China, etc… There was even a few of the terracotta warriors. After a few hours in there, the rain stopped. We went back to the pagoda and walked around the grounds. The large water fountain was still going during the day as well. We went into the pagoda to get a view of the city from the top. Funny thing happened after we left the pagoda. There are a lot of these “tour guides” that hang around the tourist spots that always come up to you and ask if you want a tour… anyways, one of these guys came up to me and was being very persistent. I told him that I couldn’t speak speak chinese and I guess he didn’t understand what I said and took it the wrong way. Fisticuffs nearly ensued. After we ate, we went to walk around the city wall. There’s a huge wall that goes all around the city… well, the original city of Xi’an. It’s quite interesting, all the older buildings are inside the walls and the new ones are outside the walls. It’s an interesting mixture of old and new. Got some pictures of some interesting snacks and Mcdonald’s pies that we don’t have… Banana and taro root. We grabbed dinner afterwards and went back to the hotel. We have an early flight in the morning to Beijing.